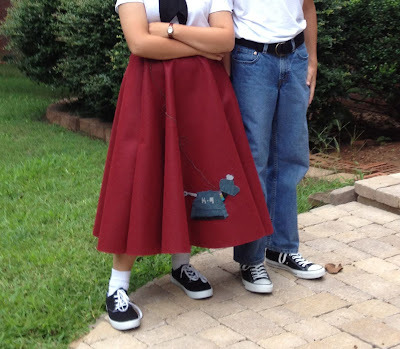 crafty lil' thing: Fan Girl + Sock Hop = Awesome! Fan Girl + Sock Hop = Awesome! We have started swing dancing. Let me rephrase that. K has started swing dancing, and Mr. Man and I go along to chaperone. We dance a few, but we just aren't in shape, yet. K on the other hand, dances the all night. Well, till about 9:30. She's a beginner, but she's getting the hang of it. And all her friends are beginners too, so they have a great time. So, the weekend before school started, the local swing dance society held a back to school Sock Hop. With a costume contest(!!!!!) K wanted a retro 50's dress(!!!!! ), we looked at patterns, and even though we started a week ahead, we just didn't have the time. So, she settled on a poodle skirt. Now, K is a fan girl and not a girly girl at all, so though she wanted to wear a poodle skirt, she was not interested in some fluffy pink poodle on a pearl leash. Oh no. It had to be something fan related. 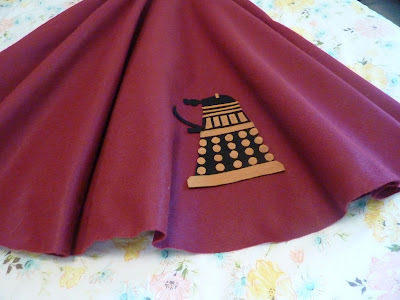 Her first thought was a dalek skirt, with big yarn pom poms in lines all round and felt strips for the bars. Fabulous idea, too funny, but she decided that would be too obvious. She wanted it to be subtle. She just wasn't sure what she wanted, so we picked a burgundy felt for the skirt, a wide black elastic for the waist, some shear black to make a scarf, and she picked out a bunch of felt rectangles, in a variety of colors for the decoration. My job was to make the skirt, which was the easy peasy part. Her job was the decoration. Exterminate! It looked great on the burgundy. Done! That was easy! But, the next morning she got up and said, "Mom, it has to be K-9 poodle skirt!!!!" Yup, has to be. So she set to work. Cute! And the leash is ball chain!!!! I love that part! She loved it, it was a big hit, and she had a wonderful time. One of the older dancers told her at first, he just thought it was another poodle skirt, but then he looked close, and it was the coolest poodle skirt EVER! We left before the costume contest, but we didn't care.